Custom Imprinted Golf Umbrellas in Bulk. Windproof, Vented Double Canopy, Fiberglass. -The "Typhoon Tamer" withstands 48 mph winds! Best price in the USA and Canada. Bulk custom imprinted fiberglass golf umbrellas, 62 in. arc, windproof , with vented canopy (double canopy), matching nylon case and hardwood handle. 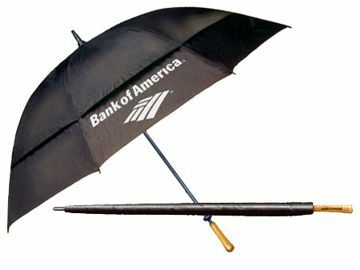 Budget Prices in the USA and Canada for custom imprinted fiberglass golf umbrellas . American clients pay no taxes. Free artwork design. All fiberglass frame and shaft, lightning resistant, will not invert in strong winds, able to withstand 48 mph winds, thanks to its cutting edge umbrella technology, the Flexoframe™ all-fiberglass construction and the vented canopy. Weighs only 1.2 lbs. Matching nylon case with shoulder strap. Hardwood handle suitable for lasering. Packaging: individual Box. UG1-ALT : Typhoon Tamers with Alternating Panels. COLORS: Royal Blue/ White, Red/ White, Hunter Green/ White, Navy Blue/ White, Black/ White, Purple/ White. UG1-CHECKER: Typhoon Tamers with Checkerboard Panels. UG1-SOLID : Typhoon Tamers with only one color (all panels have the same color). 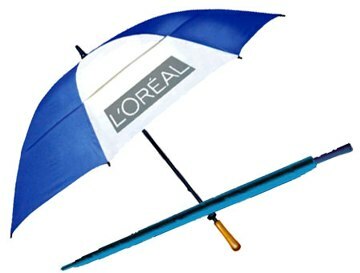 IMPRINT SIZE ON ALL UMBRELLAS: 10" x 8"
PRODUCTION TIME: 10 days after art approval; contact us for faster production. 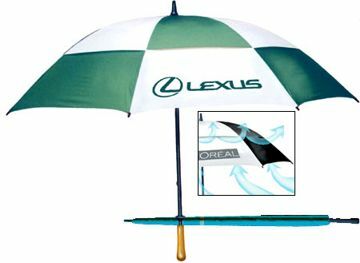 Unit Prices below include your 1-color custom imprint on one umbrella panel. Add the amount shown for additional imprint colors, or additional imprint locations. You may order any in-between quantity. SETUP CHARGE: $49.00 per imprint color. Please add $1.20 per umbrella for imprint on the matching case (sleeve). Production Time: 10-12 days after art approval.